Let me start this post off by saying I AM IN LOVE! All of my information is from the Limecrime.com website. Glow: Soft, luminous finish. Not satin, not shimmer. It’s glow! Let’s take a look at the inside, shall we. See I told you it was beautiful. Now I know you’re dying to see swatches so I’ll jump right into those. Last but not least I’m going to show you the back of the packaging as well as a close up of where it says cruelty free and vegan. I want to finish this off by saying if you like the color selection of this palette, you need it! I was very hesitant on purchasing this palette. Why you may ask, because let’s be honest…. 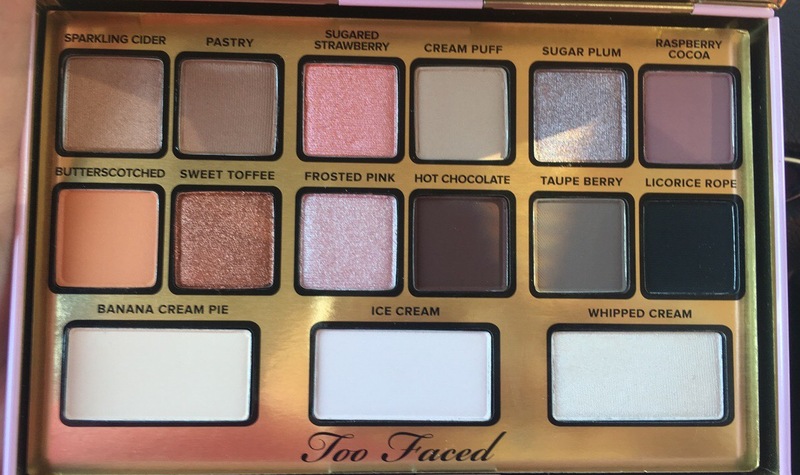 lately too faced hasn’t been doing so well. 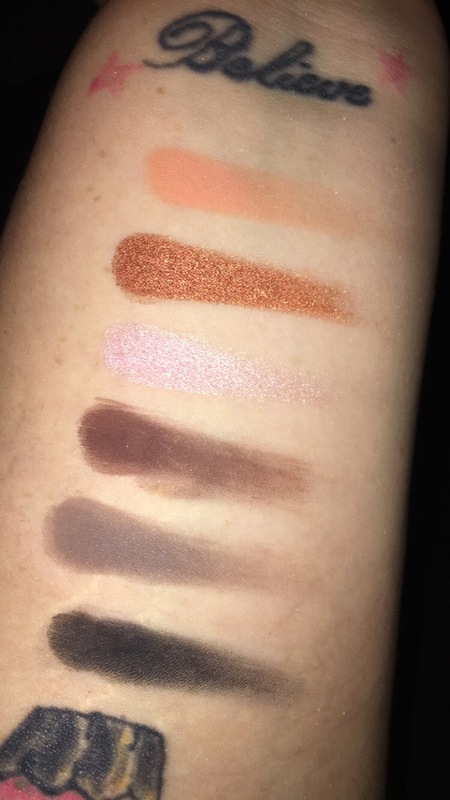 I bit the bullet and went into Ulta and I swatched the palette and instantly fell in love. 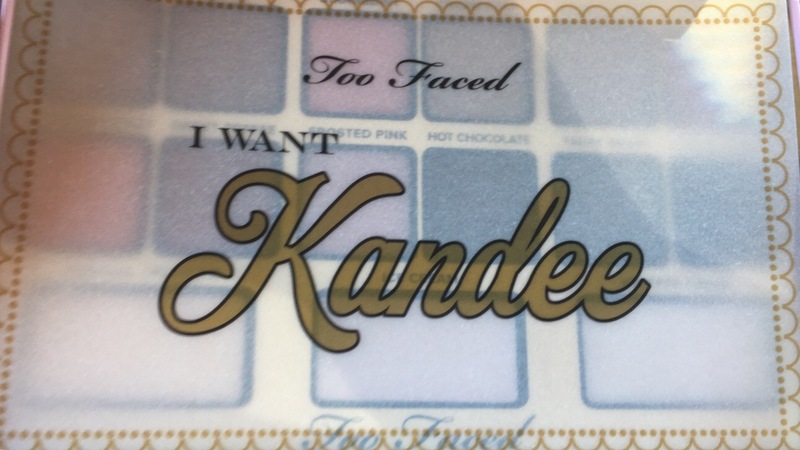 This palette has beautiful pigmentation and amazing neutral color selection…. if these colors speak to you, BUY IT! Let’s talk about the packaging. 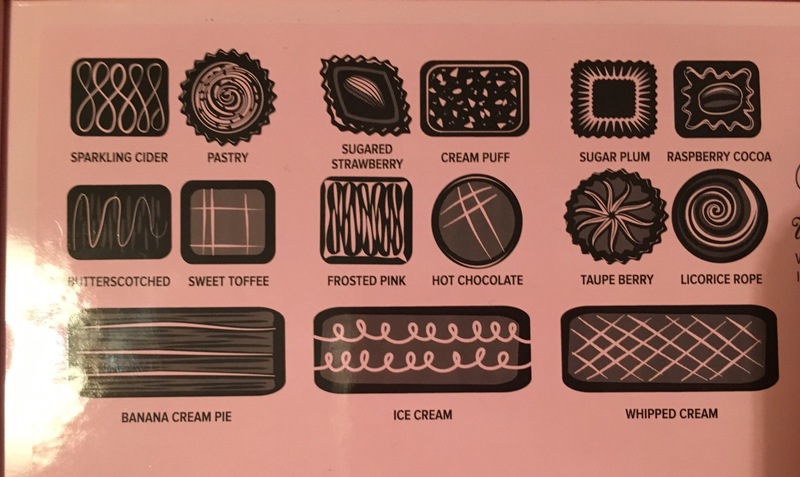 This palette comes in a tin that looks like an old school candy box. The back of the tin even features the shade named but with a candy picture… just like candy boxes do. The attention to detail is phenomenal on this packaging presentation. Once you open the tin you see a piece of thick waxy paper on top of the shadows (as if they were candy pieces). Now I know you’re sitting there like “SHOW US THE SHADOWS ALREADY” so let’s jump into it. 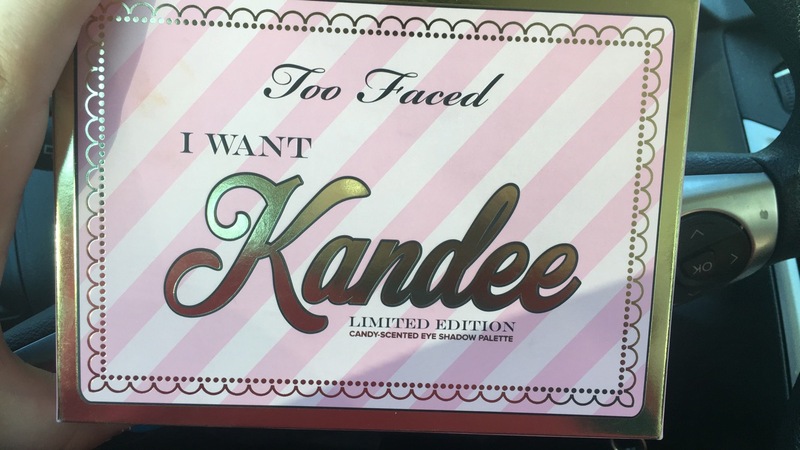 The swatches speak for themselves, Too Faced and Kandee Johnson did an amazing job on this palette and the entire I want kandee collection honestly. I would definitely recommend you pick this palette up! Let’s start off with a few key things about this kit! The kit itself looks like this. Moving on to the contents of the kit! Let’s begin with the Lancome definicils mascara! Next, we have the Beauty blender! Then, we have the becca shimmer skin perfector! Following, we have a nars blush! Second to last, we have an urban decay single shadow! Finally, we have the Tarteist glossy lip paint! 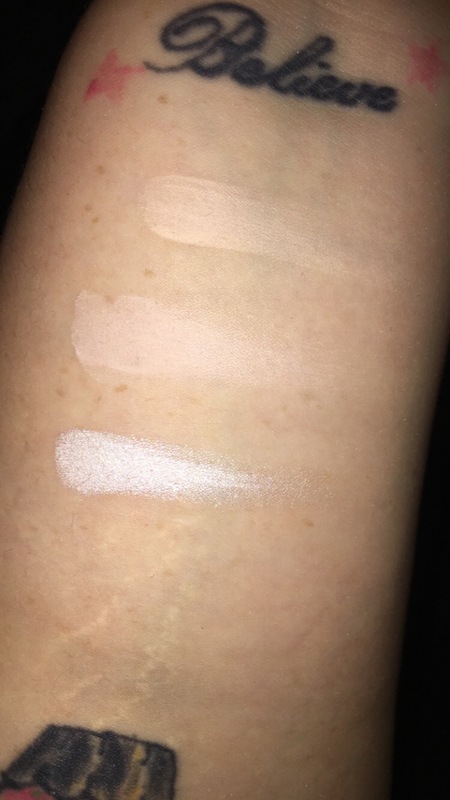 Last but not least we have the long awaited swatches! All in all I think this kit is an amazing deal! You should totally run to your nearest sephora inside jcpenny and pick this up! I know this palette isn’t anywhere near new, but it’s new to me. I’ve been eyeing up this palette for a long time…. my friend even suggested I get it because it’s “so me”. I hesitated because of the fact that I already had so many palettes so did I really need another one? Once I found out it was going to be a part of ulta’s 21 days of beauty sale I knew I definitely needed another palette! The link provided is my person ebates referral link, when you sign up through my link you’ll get a free $10 to start your cashback savings! Let me show you the unique packaging of this palette, it’s called the unzipped so what better then a zipper on it? I know, I know…. you’re here for the inside! Let me just say that in my opinion this is the most beautiful rosy-toned eyeshadow palette I have ever had the honor to lay my eyes upon. 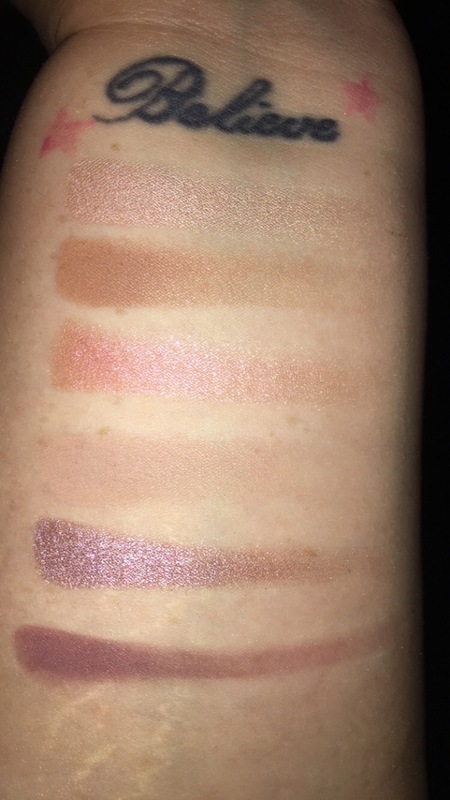 I apologize for the messiness of these swatches. Let’s start off with a few key things about this palette. Now onto the packaging! Oh my god is it stunning, It’s like looking into a kaleidoscope. I know you must be dying to see the inside of this beauty, well here it is! isn’t she amazing?! This is tarte’s first colorful palette and boy oh boy did they nail it in my opinion. Not to mention the pigmentation is flawless. I personally believe this palette is worth it to go pick up. Breath taking packaging, highly pigmented shadows… what more could you ask for? I do wish they would have added one or two more matte shades in here but since they didn’t that just means you’ll get use out of two palettes that day! I highly recommend this palette.